New parents struggle a lot when it comes to learning and figuring out how to calm their children to sleep. The very first weeks are especially critical as they form the foundations for the baby’s sleep patterns. In the presence of distractions or discomfort, it can be really difficult for your little baby to fall asleep. Sometimes your young one might even start crying. Considering how important sleep is to the health and wellbeing of your kid, here are 4 ways to help calm your baby before sleep time. There are always some few things here and there that will get your baby’s attention. Just to name a few, some of these may include noise from the TV, seeing toys around, noticing people in the room, and of course snacks. Such distractions can cause your rather overstimulated or tired baby to remain restless and alert. The best way to help calm is to get rid of such distractions or perhaps take them to a darker room with no noise. You can also sooth them with white noise or soft music, which helps create the calmness needed for your baby to fall asleep. Since time immemorial, swaddling has been proven to help calm babies. However, it’s never a one-size-fits-all affair. It’s important to make sure you use the right size of blanket for their body size. Swaddling involves wrapping them in a soft snuggly blanket. This is based on the fact that babies want to feel you around them, and swaddling does just that. It brings to them the idea that you are holding them even in their sleep. It protects and calms them down. It’s an age-old method for child caring that won’t let you down. If you are not sure of how to do this, ask your pediatrician for help. When it comes to calming your baby, it’s important that you know of this technique. It involves some basic brain training that helps prepare your baby to sleep. You may start off by giving you baby a calming warm bath, applying cream or lotion and massaging them. Afterward, dim the lights and sing them a sweet lullaby, or play some soothing music. You may use a rocking chair or have a snuggle time with them in bed, either way, by this time, they’ll definitely be ready to sleep. Ensure that you do this after some minutes of playing and feeding. Do this on a routine basis to help train their brains. In the early stages of development, reading a book to them is as important as singing a lullaby. Babies are fast learners. They will listen to you as long as you use the right baby tones and you make it exciting. In this case, though, you don’t want to make it all exciting but soothing. Get a sleeping book and go to a calming chapter. Always ensure that you read with a relaxed voice as they can also sense the tension in our voices. Build up the story with your inflections while maintaining eye contact. While reading, ensure that the baby is either lying on their bed or in your arms, not far from their bedroom. Finally, if your baby won’t sleep in cot or bassinet even after doing all of the above, change its position. 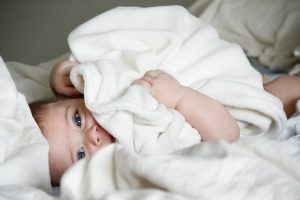 You may also want to change the sheets or make it warmer before you place the baby in it. Remember, their skin is more sensitive than yours.